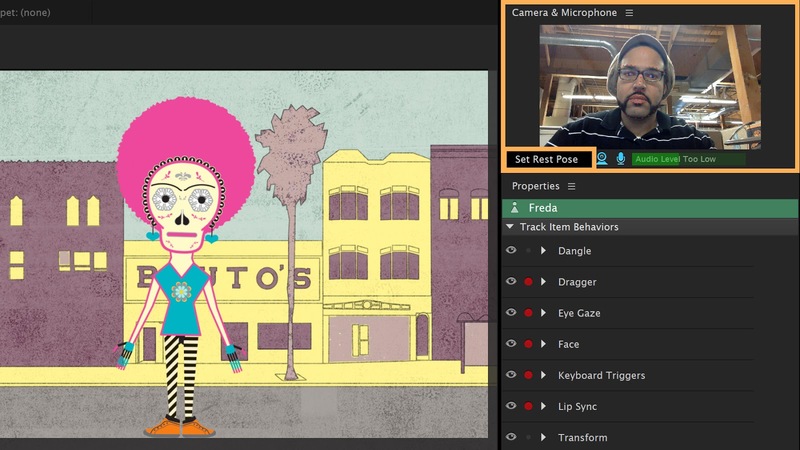 [ #Animation #CharacterAnimator #Character #adobe ] Adobe has announced that Character Animator CC is now out of Beta and will be available for rental customers in the next couple of days. Character Animator allows artists to animate artwork created in Adobe Illustrator CC or Photoshop CC by using a mouse, keyboard shortcuts, or multi-touch gestures, as well as automatic lip, syncing and facial animation capture from a camera. Check out new features that make bringing your characters to life faster, easier and more fun. Show, hide, swap, or cycle through puppet layers with your keyboard or MIDI device. The new Triggers panel gives you a central place to manage all your puppet’s triggers. Toggle layers on and off, or create swap sets to show one group of layers at a time, such as for different hand gestures. Triggers can even reference layers in different groups. The new Controls panel displays triggers and puppet properties as buttons and sliders, and automatically generates button designs based on your artwork. Whether you’re performing live or recording for later, the customizable visual interface makes it easy to see everything your character is capable of. The layout is stored with the puppet so you can share trigger layouts with other people. Added eyebrow rotation and movement gives you more expressive characters, from worried or angry to surprised. A new snap eye gaze feature gives you more control of pupil movement. The new pose-to-pose option smooths out the transitions between your character’s poses for a hand-animated look. Control the amount of smoothing and how long to hold each pose to better match your performance to your puppet’s appearance. A new Physics behavior includes Collision, which enables your puppet to run into and bounce against environmental elements or another puppet. Trigger a specific layer in a puppet or group with Layer Picker. Fader lets you hide or show specific parts of your puppet. Waveform displays give you a visual method for aligning audio, plus Direct Link enables roundtrip support with Adobe Audition. Mouth shapes match more accurately to corresponding sounds with the new lip-sync algorithm. Lip sync (including edits) created in Character Animator can be copied and pasted into After Effects. Rigging a puppet with independent parts is now more streamlined with automatic attachment of these independent groups to their parents (e.g., arms, legs, or other parts that overlap a torso or other part of a character). For newly imported artwork, position the group’s origin to where you expect it to attach–no more manual stapling or extra staple handles. New visualizations in the Puppet panel show how independent groups attach to their parent group’s mesh, which now includes a yellow outline to indicates the selected layer in the Puppet panel. A clipping mask lets you use the content of a layer to mask the layers above it. Use multiple layers in a clipping mask with successive layers. Control your puppet with a MIDI device.